I also found two premium plugins, including OptinSkin and WPSubscribers. Each plugin is reviewed and rated with plenty of screenshots to show you the type of setup and configuration options you’ll encounter, plus the MailChimp info you’ll need to make them work. The first section of the report shows you how to get the raw form code from MailChimp and how to strip it down to the essentials you will need to create your own custom forms. You’ll also find sections on how to locate your List IDs and API Key that are needed to integrate with each plugin. 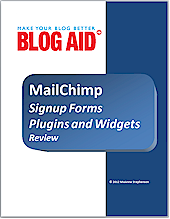 MailChimp Signup Forms, Plugins, and Widgets Review is a zero obligation report, meaning that it really is free. You don’t have to sign up for anything, just download it. So, what are you waiting for? Go get it!